Overwatch’s newest hero Moira has lit a fire under the community and its enthusiasm for lore and speculation – they have already got a legion of ships, comic strips, and assumptions about the latest addition to the cast. I spoke to lead writer Michael Chu, who weighed in on all of it – including what exactly is up with that Naruto run – and dropped a few hints as to the wider implications of Moira along the way. Related: Check our guide to the best anime games. Chu is right: Moira isn’t traditional in a lot of ways. An androgynous, 48-year-old woman with a cruel sense of humour and a delicate balance of damage and healing output, she continues Overwatch’s theme of being just off-center enough to be unique. The depths of that experimentation were hinted at in her origins video, though Chu thinks it may have been overemphasised just how bad she went with it. 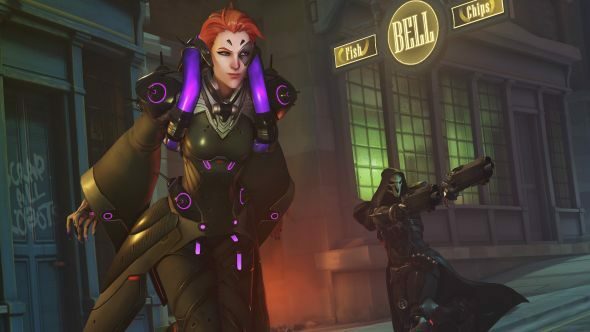 “I’ve been watching some of the discussion about Moira and it’s possible to overstate what she was doing, especially [early on],” he says. “The way I always think about Moira is a scientist first and foremost, she isn’t particularly interested in the practical application of her knowledge. That isn’t to say that she doesn’t want to understand how manipulating genetics could have an effect on curing a disease or something like that, but she’s not like a Winston who says ‘I’m going to invent a way to anchor things in time and then I will build a chrono-accelerator, or a rocket engine’. She’s not like a Mei who uses her scientific knowledge to solve the climate problems that are facing the world. That begs the question of how a game like Overwatch, which glorifies scientific discovery as something that pushes us forward as a species and improves quality of life, can paint a scientist as a bad guy. “She’d caucus with the bad guys because she’s a member of Talon, but she falls more into that Sombra area – and, honestly, a lot of the villain characters in the Overwatch universe – where the means to which they are willing to go is the questionable part. Two other elements of Moira’s character that have garnered attention since her announcement are the extent of her self-modification and her relationship with Overwatch’s other primary healer, Mercy. Both are a little different from how the community has interpreted them so far. In the case of self-modification, beyond what we see in-game, it is not a huge part of her character for Blizzard. “When you think about Moira and her methodology I wouldn’t say that [self-modification] is her primary form of scientific experimentation,” Chu explains. “We really put that in there as a quick… These origins movies are about giving you a few images that really try to tell you what this character is about.” In essence, the Overwatch team have only got a couple of minutes to tell you as much about a character as they can, after months of working and reworking. “The idea that the scientist is so [curious that] she would experiment on herself, is really meant to illustrate that she doesn’t quite follow the same methodology that you would consider a best practice,” Chu says. A far cry from Mercy’s do no harm and angel wings, then, even if she does bring people back from the dead. What do those two characters think of each other? Stepping back from the in-game lore and looking at the design process, Moira came together relatively quickly on the art side, while actually writing her took a bit longer. “Arnold Tsang, who is our assistant art director, who has concepted the vast majority of the heroes in the line-up – he is a genius and I am constantly amazed. In the Overwatch What’s Next panel he showed off some of the original concept art for Moira, and there was one in particular where she has tentacles, she’s got like this tentacle backpack thing. “That was his first drawing of Moira based on our discussion of her being a healer-support character, and [me saying] I wanted her to be in Blackwatch. Based on that he drew that, and when you look at the final art, it is like two iterations away from his original piece. That’s crazy to me, when I’m working on the story for a character it’s much more noodling than that. Gameplay was rather quick, too – both the community and development team agreed that the game needed a new healer support character who would fill a little of the same space as Mercy. Chu says the iteration on ultimates and abilities took a normal amount of time, but the initial choice of role made everything else a bit easier. “When I’m thinking about the personality, how the character talks and the backstory, one of the things I really look at is what we have out there,” Chu tells me. “Obviously art contributes a lot – Arnold and the art team and I, we like to go back and forth a lot so there’s a lot of shared inspiration there. “Specifically I really like to look at the game mechanics because I feel like there’s a magic when the mechanics speak to the character. One of my favourite examples of that is Reinhardt. When he puts his shield up, when it’s [running out of power], when he charges in – there’s an empathic link between you as the Reinhardt player and Reinhardt the character that is powerful and just makes sense. He should be a protective character because he’s got the big shield and that’s his function in the game, it’s a good synergy. Sometimes you just have to ask: so, what is up with that Naruto run? “This is hilarious. One thing I would say broadly, the development team, the artists, we’re all big anime fans – I certainly could not deny some of the references in her sprays and stuff,” Chu says. “The run in particular, we felt like her design with [her clothes] and her stance really contributed to a dynamic and visually striking character. We thought that with the cloth and the hip panels she has, having her have some of these exaggerated movements really looked good and also help her be distinct and identifiable on the battlefield. Despite the references, Moira is her own character, and brought to life by Overwatch’s usual standard of excellent voice acting. Genevieve O’Reilly takes the part, her most famous prior role being a leader of the Rebel Alliance in Rogue One, and Chu says she nailed the exact combination of tone and ethereal presence he was looking for. “With the character of Moira, she has these sort’ve magey elements – she’s the closest to a traditional spellcaster, warlock, mage as we’ll probably get in Overwatch – and I wanted her to be so into the science that the world is the secondary concern. I tell people this story where Moira is working on her experiment and someone is talking to her and then after a while she’d be like ‘oh, are you still standing there?’. Then she’d go straight back to her work because she’s so in touch with it and that is the world that she actually lives in. “We’re always trying to find a new space for [new characters] to occupy. That’s in vocal tone, that’s the way they speak, their sense of humour, all of that,” Chu explains. “What I would say about Moira is that I wanted her to be a more heightened character – someone like Sombra is very naturalistic, you could imagine someone talking like Sombra on the street or just walking around with your friends. There is still plenty of room to expand with Overwatch’s latest character too. In fact, Chu built Moira as something of a bridge between all the different factions of Blizzard’s world, with the hinted at ‘Venice Incident’ at the centre of that. While Chu laughed and said “it’s classified” when asked directly about that particular hint, he did confirm that she is a plot thread yet to be developed.